I was asked recently to photograph my 1985 Robin Medley Custom so I thought I’d share some of the pics. I don’t know how it happens, but when it rains, it pours. I love Gibson acoustics. I especially love Hummingbirds, Doves, J200 etc. They always remind me of the cowboy dreamworlds I lived in as a boy. Note the subtle differences between the model years. 1997 was, as I understand, the second year of production in Boseman, Montana. It’s top has aged very nicely. 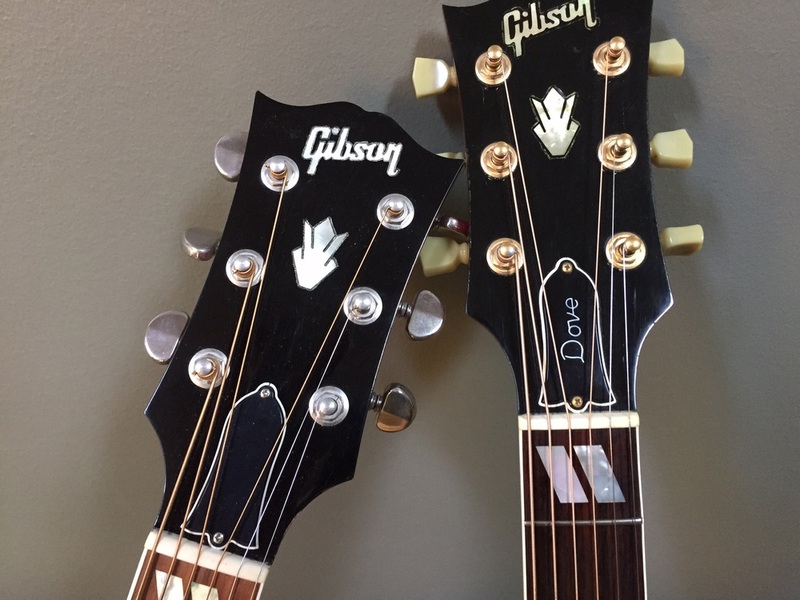 The gold & pearl Kluson tuners differ from the Grovers on the 2007. The headstock inlays are much nicer on the 2007. They are much more defined with much less filler. 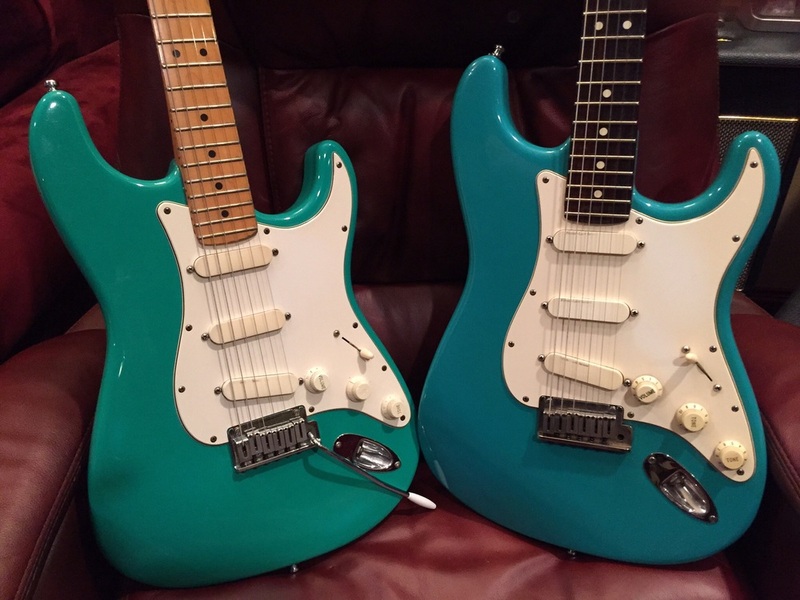 Two are better than one… The ’88 on the left with maple neck has faded to a nice flat green patina. The ’87 on the right belongs to friend/student Gerry Maizlish and has an almost Aqua hue to it and rosewood fingerboard. Both great players guitars! I just picked up one of my dream guitars. These Gibson acoustics really do something for me. I already have a beat up J-50 and an early 2000 Hummingbird. Now, the Dove! 5 piece neck, beautiful curly maple back and really a deep, loud acoustic. Pre-installed LR Baggs Element pickup too. Montana made. 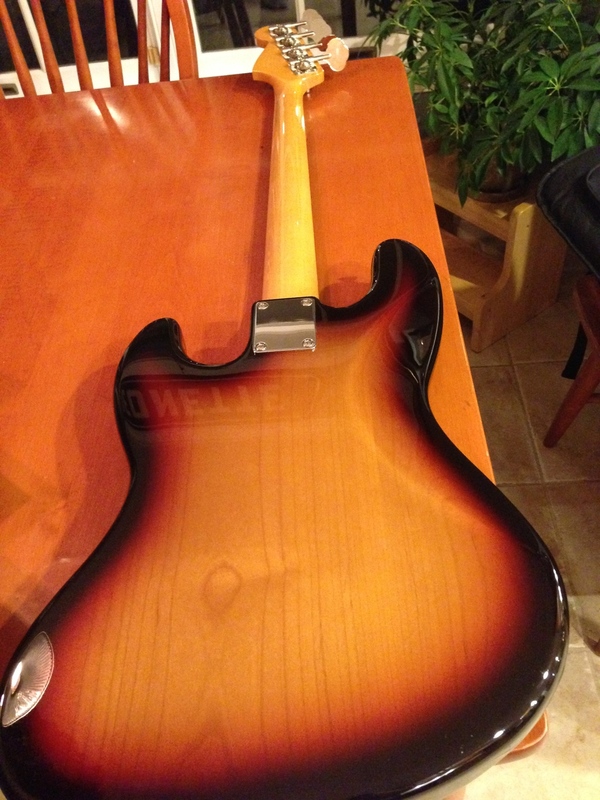 I just bought this Strat Plus a week or so ago so these are not very good pictures. 1995 was the next to last year of production. The nut is great with ball bearings for the strings to roll thru. The knobs are from a different Strat Plus and i don’t have a whammy bar for it yet. It sounds great and plays nice. I have been searching for a Mustang Bass or Musicmaster Bass with the medium scale length for months now, but the prices just didn’t seem realistic. Well, problem solved. 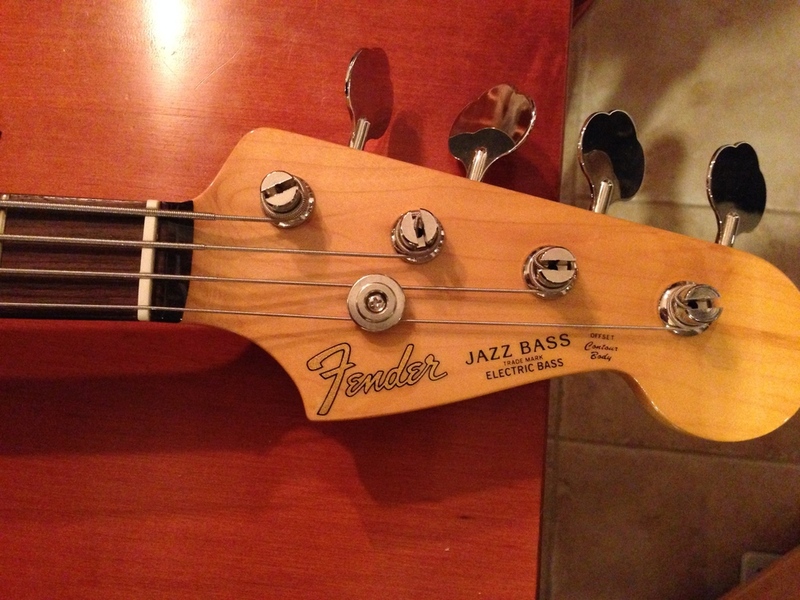 I just found this 1962 Re-issue Fender Jazz Bass imported direct from Japan with a medium scale neck! This model is not for sale in the US and was sent over from a dealer in Japan called IshiBashi. It’s weight and 30″ scale is perfect for me. The quality equals or surpasses most American Fenders that I’ve seen lately and the Re-issue is as accurate as can be. One of my favorite sounding lap steels. I bought it from Bob Campbell Sr. many moons ago. It has a Fender Mustang looking pickup that really sings, right out of the case. My “Go To” Lap Steel. It’s pictured with even an older Fender Electro steel signed in the body cavity by Leo himself. (As with all posts, Click the Pic to enlarge. From 1984 to 1987 Japan made re-issues are as historically accurate as can be. I should know, as I’ve owned both the original American made 60’s guitars that they are modeled after and the re-issues that I collect now. As Fender ceased US production in the mid 80’s to move from Fullerton to Corona, CA, the Japanese re-issues were shipped here to meet demands. 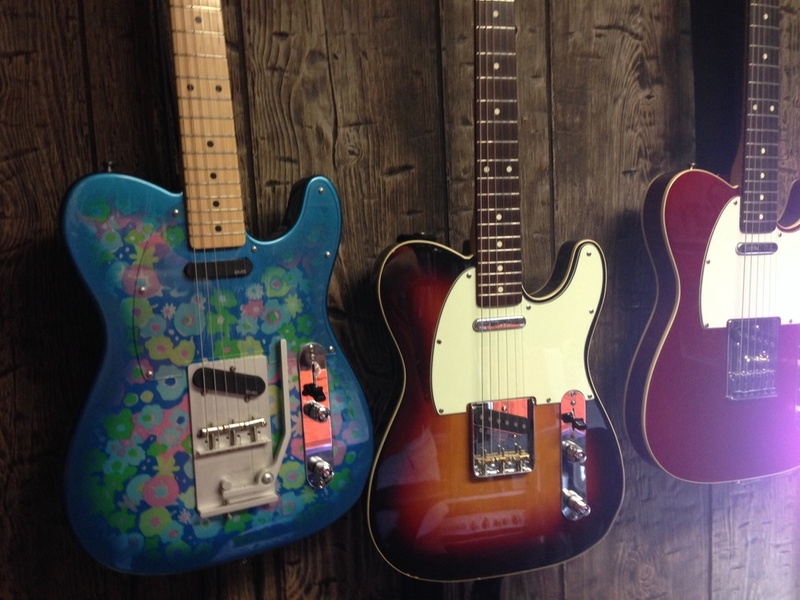 Pictured here are 3 Tele’s from that era. The red ’85 is new to me and is very hot with Schaller pickups and a 6 piece heavy mass bridge that rings true. 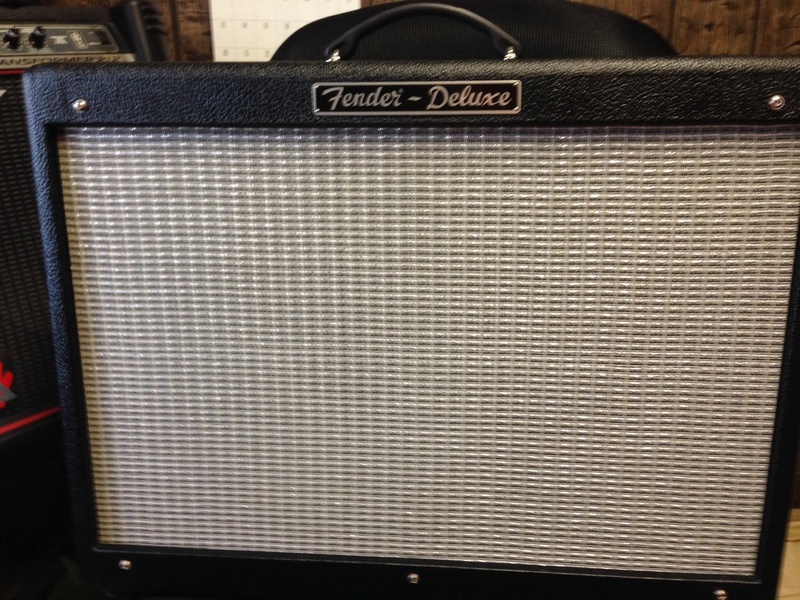 Picked up this mint Hot Rod Deluxe last week with new Groove Tubes and a Cannabis Rex speaker. 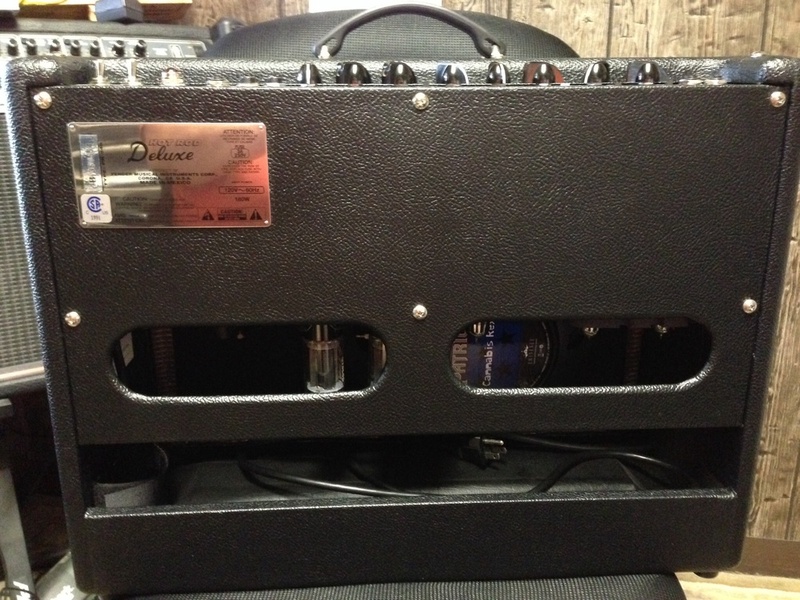 40 watts, all tube, two channels plus boost. Very rocking amp! Designed and built for me by Seth Connors, includes Jangle Box compressor, Fulltone, Fulldrive 3, Mooer Mod Factory (11 in one effects), Mooer Analog Delay, ART A/B switch and Antique Laxative box. 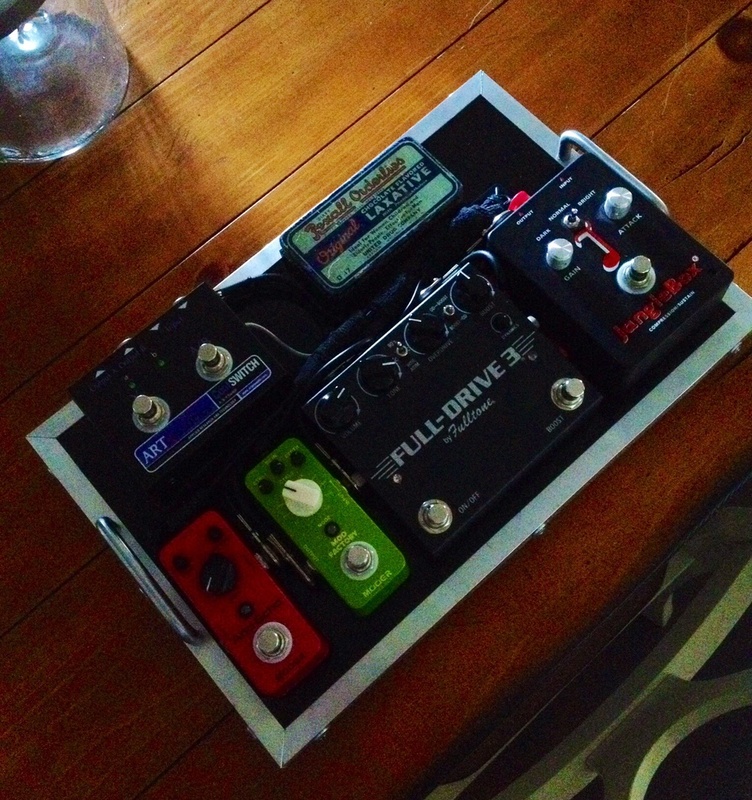 Photo #3 Cmatmods Deluxe Compressor, Photo #4 EH Soul Food for mini-travel board. I was looking through guitars I haven’t played for a while and realized that I never even featured one of the nicest sounding guitars I own. 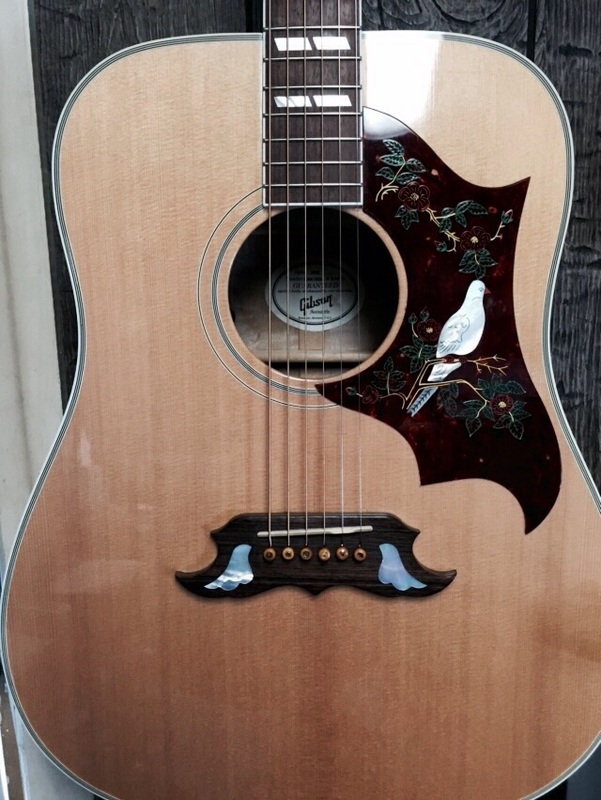 So here goes… This 2001 a Gibson Hummingbird was bought slightly used by me in 2005. It features an LR Baggs acoustic element pickup, which I love, but it sounds even better unplugged. My “Go To” acoustic for special occasions. It plays like a dream too. 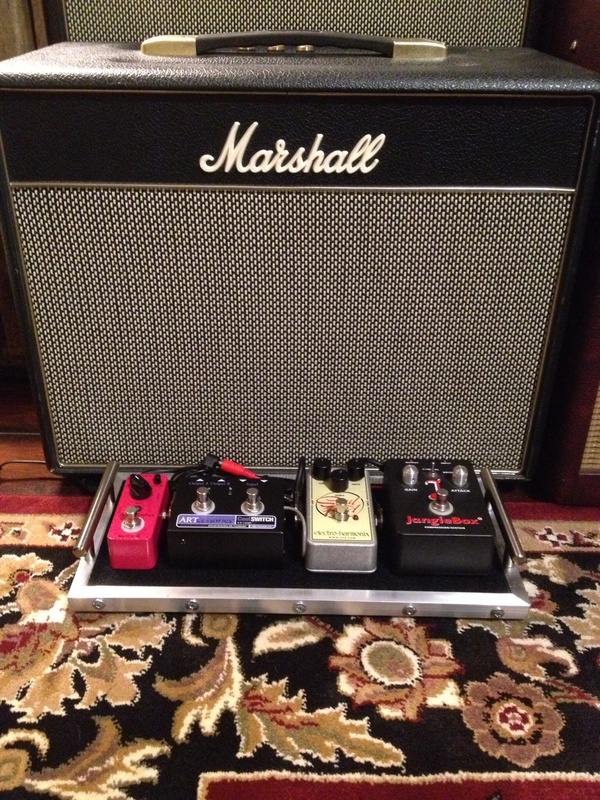 Marshall Class 5 amps + EHX Soul Food , Jangle Box and Mooer ! Highly recommended by my nephew and guitar consultant Seth Connors, I bring you, direct from England, 2 all tube Marshall’s with amazing punch and sustain. These are Series two models and no longer in production. They can both drive extension cabs or deliver just 1 watt each for recording purposes and massive distortion amounts. 5 watts never sounded so great. Both amps feature nothing but vintage Marshall tone. I’m pairing them with a Mooer AnaEcho pedal and the new Electro Harmonix clean boost with overdrive pedal, “Soul Food”. I can switch from one to the other or run them both together with the ART ABY box. If I throw in my Jangle a Box compressor or a half size Mooer Reverb pedal I’ll be set for anything! 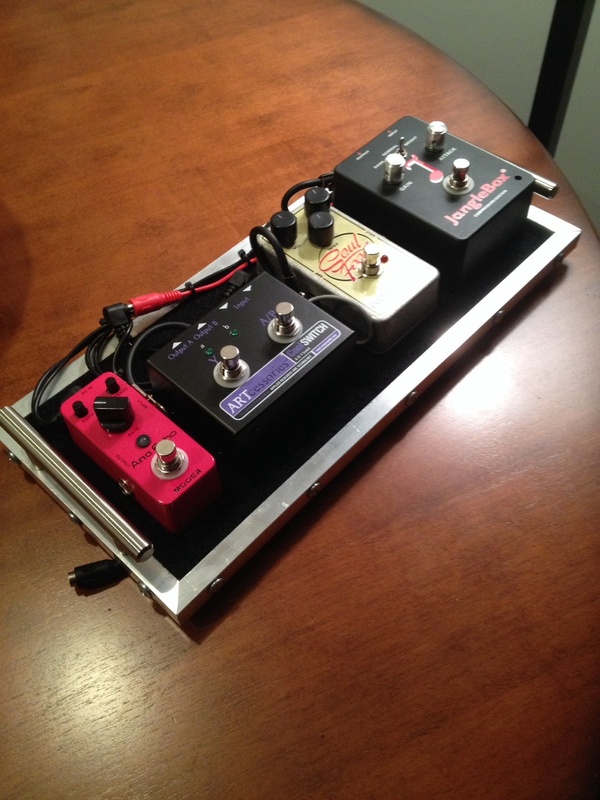 Pedal board designed and built by Seth Connors. I was lucky enough to own an original 1968 Paisley Tele in the late seventies and I never forgot it’s light weight spanking tones that seemed to be present at darn near any volume. 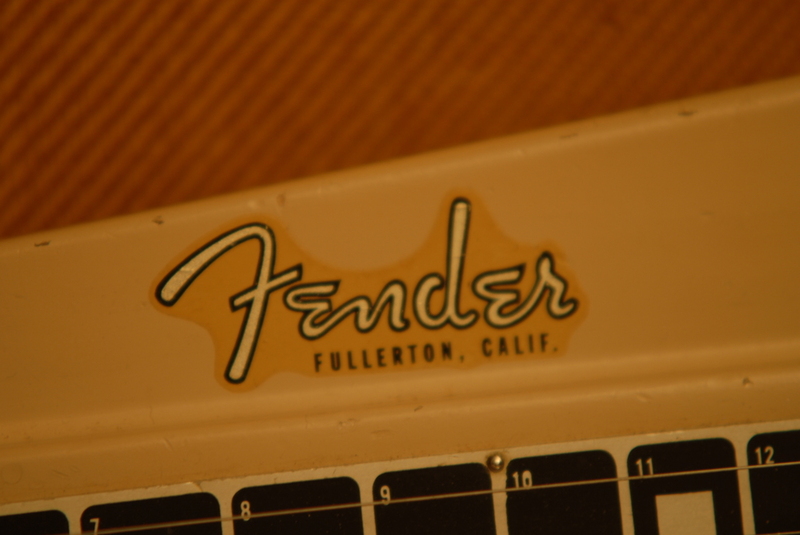 Years passed and I ran across some information about Fender’s brief but productive shift to Japan and the amazing re-issues they were making while the Fender plant was shut down in Fullerton California and moved to Corona. I own a few Tele’s from that era and the only one I’ve left completely stock is the Paisley. It feels and sounds just great the way it is. Pictured side by side with mine is another 1st year re-issue owned by my friend and fellow teacher and awesome bluegrass legend, Randy Stewart. Fender has twice re-issued these Paisley Telecasters since 1984 but the pickups are not as lively, the pots are smaller and he wiring is less than code. I can’t afford to return to 1968 but 1984 is just fine with me. I know I have too many steel guitars. When you sit behind one of Bud Carter and the late Larry Agan’s ETS steels you just feel at home. This one came my way via the Steel Guitar Forum and it needed a few tweaks so … I sent it off to Mabank Texas for Bud to set up. It should re-arrive at my house by mid next week. While not as striking as my red metal flake ETS from an earlier post, it’s still a great instrument that I’m lucky to own. Now I have two identical steels for work and for travel. No surprises! My wife Nancy actually found this cool mahogany Martin on a local list serve. “Women in Music” was the theme and 440 guitars (mine is #283) were made with profits donated to Women’s breast cancer research. Each guitar was signed by C.F.Martin IV. I’m told that 49 were made as deep body 00-16 models. The body is dreadnought thick, 1/2″ thicker than standard 00 models. The braces are scalloped and the fingerboard and bridge are ebony. It is loud and sweet! After selling old blue, my BMI steel guitar posted last, I searched for another light weight single neck 10-string guitar that I could afford. I found this “sold but unplayed” 3 pedal, 4 knee lever JUSTICE guitar direct from renowned builder Fred Justice. It’s only the second one of this model he’s ever built. It’s got a light weight maple body and neck, unpolished end plates and economy brushed chrome parts on top but underneath… It’s all JUSTICE! Solid, reliable, great sounding including a “George L” E-66 pickup. I’m still lending an eye towards a Mullen Discovery or a Zum Encore (both similar guitars but more $$). For now however, this great sounding steel does the trick. Fred answers every call, walks you thru the set up and calls you back in a few days to see how you like it! Just the best service you could imagine. 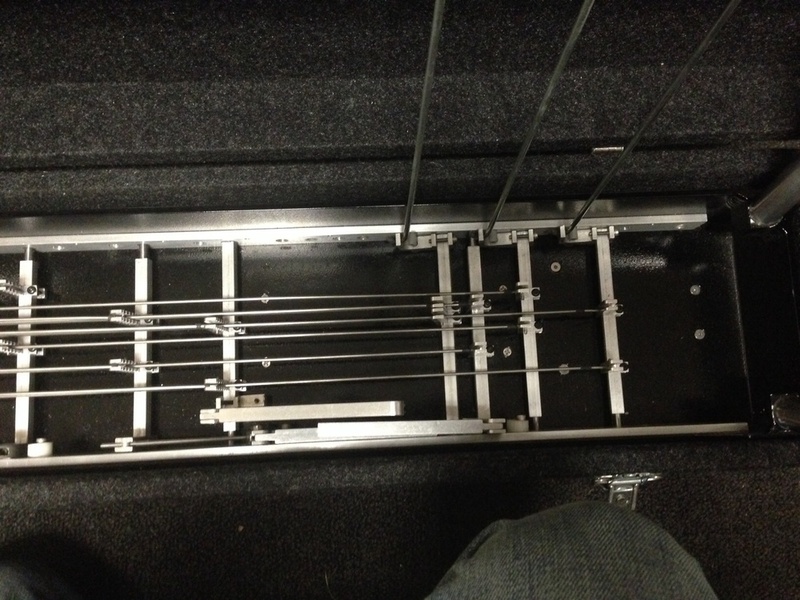 I’ve owned this great BMI S-10 pedal steel for at least 20 years now and it seems that the time has come to say goodbye. Used on countless recordings and live dates, this steel has become a part of me… A very heavy part of me! With the advent of the new light-weight pedal steels like my ETS shown in an earlier post, these old heavy-weights are becoming the “stay at home” guitars of choice for older, less traveling players. I so loved my new ETS that I began researching various other company’s offerings. I needed another steel for my studio as well as one for home and traveling to the few events that I still play each year. I found an S-10, 3×4 (3 pedals, 4 Knee levers) made by renown builder Fred Justice in Arizona. I will feature that guitar in my next post. “Old Blue” will be making a trip to a northern California Pedal Steel shop soon and I’m sure it will find a good permanent home with little or no traveling from show to show. My friend Ben Reed (who I borrowed, then bought the steel from 20 years ago) has given his blessings and the new Justice pedal steel has arrived so, the time has come. 20 years ago my BMI steel was a good-buy and I’m sure its new owner knows that he got a “good-buy”. ETS stands for East Texas Steel and that’s where this guitar was made in march or april 2013. This wonderful Pedal Steel hasn’t even arrived at my door yet, but I couldn’t wait to post these great pictures from the Pedal Steel Forum. It will arrive hopefully sometime this week from a great Steel player and nice man in Mississippi, Billy Carr. It weighs only 42lbs in it’s case! All aluminum body with maple neck and George L pickup and 9 coats of laquer. Standard Emmons set up with 5 knee levers and 3 Pedals. I hope my other steels don’t get jealous, but I’ll be playing this lightweight for years to come. Cut-away, under bridge electric pickup withRosewood back and sides, solid spruce top, Aquila strings. I’m hoping that this year will be my year of the acoustic instrument. I purchased a concertina earlier in the year and am currently shopping for OM style acoustic guitars and a newer pedal steel (often played with acoustic instruments). I ran across this fabulous F-style Eastman Mandolin! I’ve had many cheaper quality mandolins throughout the years. This individually hand-crafted all solid wood mando is light and loud and years ahead of my abilities. If the phrase “the right tool for the right job” is correct, I ought to be pretty proficient by years end.